Do Amino Acids Affect Testosterone? Amino acids are the building blocks of protein. Athletes take these substances to gain strength and size, according to an October 2009 review in "Critical Care Medicine." Some amino acids increase the production of testosterone. This finding suggests that testosterone enhancement may underlie the positive effects of amino acids. Talk to your doctor before taking supplements. Sericin serves as the "glue" that holds silk fibers together. Manufacturers often add this substance to hair care products as it has many useful properties, according to an August 2011 review in "Nanoscale Research Letters." Sericin has positive effects on the body without causing toxicity. Yet, the endocrine effects of sericin remain unknown. A study described in the February 2010 edition of the "Biological and Pharmaceutical Bulletin" looked at the effect of silk amino acids on testosterone production during stress. Laboratory animals received sericin daily for about seven weeks. The researchers stressed the rodents by forcing them to swim for 30 minutes each day. Swimming decreased testosterone, but concurrent administration of silk amino acids prevented this decline. Branched-chain amino acids, BCAA, play a critical role in healing your body. You cannot manufacture this type of amino acid; it must be obtained from your diet. Supplements containing BCAA increase performance and reduce injury, according to an April 2010 report in the "Journal of Strength and Conditioning Research." It remains unclear how BCAA achieve such effects. An experiment published in the March 2006 issue of "Metabolism" explored the mechanisms underlying the effects of BCAA. Athletes received the supplement or a placebo nightly for a month. They also performed a strenuous exercise regimen during this time. Relative to controls, athletes given amino acids showed significant elevations in testosterone. Your body also cannot manufacture the amino acid leucine. This substance stimulates the production of muscle protein, according to a January 2011 review in "Frontiers in Bioscience." Such anabolic properties likely result from leucine-induced testosterone production. An investigation presented in the June 1997 edition of the "Journal of Sport Medicine and Physical Fitness" tested this hypothesis in weightlifters. Participants received daily doses of either leucine or a placebo during a 10-week training protocol. Relative to placebo, leucine enhanced testosterone 20 percent within five weeks. Testosterone returned to baseline levels during the remaining weeks. Leucine breaks down into several active metabolites. One of these substances, beta-hydroxy beta-methylbutyrate, has a broad range of medicinal effects. Better known as HMB, this chemical increases physical strength and muscle mass, according to a July 2010 review in the "Journal of Pediatric Endocrinology and Metabolism." The anabolic effects caused by HMB suggest that it affects the testosterone system. A study offered in the May 2009 issue of "Medicine and Science in Sports and Exercise" measured the effects of HMB on hormone production. Healthy men received either the supplement or a placebo each day for four months. The participants also lifted weights during this time. Relative to placebo, HMB increased the production of testosterone and growth hormone. Does Protein Powder Do Anything Bad to Your Body? 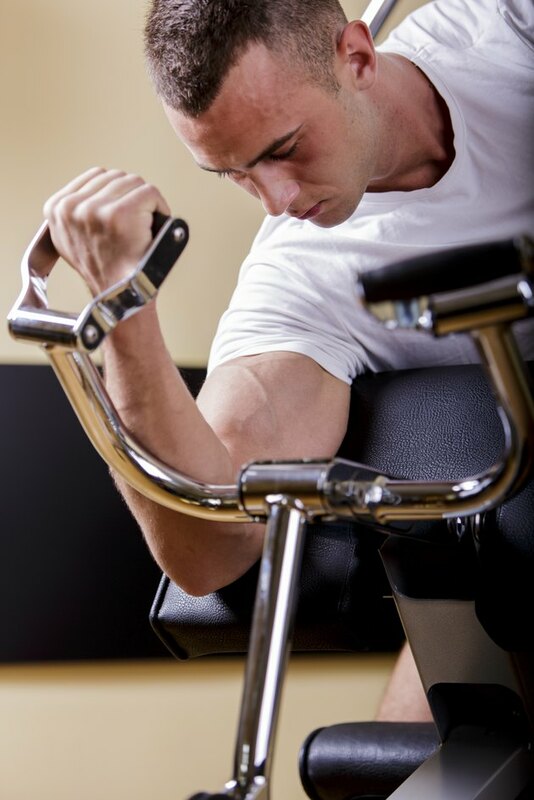 Does DHEA Raise Testosterone Levels in Men?